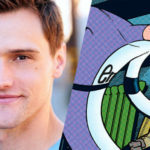 Today the CW announced the casting of Hartley Sawyer as the Elongated Man in The Flash TV series. As reported by Variety, Sawyer’s most recent work is also from the CW, as part of the web series Saving The Human Race. And on The Flash, Ralph the detective will apparently be joining forces with Team Flash to solve one of Central City’s greatest mysteries. Looking forward to seeing Elongated Man this season? What do you hope to see done with him on the show? Share your thoughts! This entry was posted in Media and tagged Flash TV Show 2014 on July 31, 2017 by Lia. Bleeding Cool posted some DC covers for August, and among them is the primary cover for Flash #29. It shows Barry fighting Shrapnel, who’s mentioned in the solicitation for that issue. 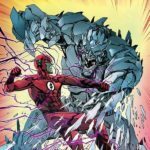 And while we’re here, CBR did an interview with Flash writer Joshua Williamson about his most recent story arc on the book, and specifically about how he sees Eobard Thawne. 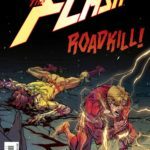 There he offers some insight into Thawne’s troubled psychology and the development of the story. Check it out, you may find it interesting. Plus, here’s a look at Barry’s daughter Nora Allen in Justice League #26, courtesy of Comicosity. The two Green Lantern kids are described as having the Allen surname as well, so it’ll be interesting to see what their deal is and how they may be related to Barry. This will presumably be another alternate future, since we were just treated to a glimpse of the potential future Dawn and Don Allen in the Flash series; perhaps history will be changed so Nora and these other kids are never born. We will have to see. This entry was posted in Flash News and tagged Covers on July 31, 2017 by Lia. 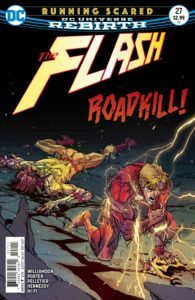 DC has released the five-page preview for this week’s Flash #27 issue, featuring the full debut of Barry as the Negative-Flash. Plus, it’s the finale of the big story arc with Eobard Thawne. You can see all the pages at Freaksugar, and the issue will be out this Wednesday. 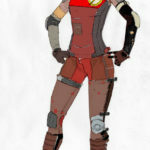 This entry was posted in Flash News and tagged Preview, Professor Zoom on July 24, 2017 by Lia.